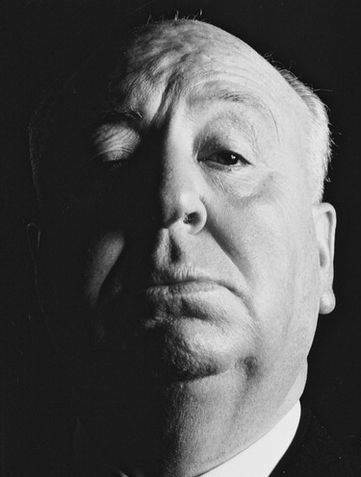 Not only is today Friday the 13th (Oooh, spooky-scary), but today we celebrate one of Hollywood's most beloved suspense/thriller directors of all time - Alfred Hitchcock. I wouldn't consider myself a huge Hitchcock fan, but I do like some of his films. One of my favorite movie genre's are suspense/thrillers, so naturally I'm drawn to his work. Hitchcock films certainly set the pace in many ways. He was nominated for Best Director five times, so it's clear that other filmmakers acknowledged his talent and skill. He was mostly nominated for his biggest hits, like Rebecca, Spellbound, Rear Window and Psycho (just as George Lucas was nominated for Star Wars) so unfortunately he never won. Today, Vertigo is considered Hitchcock's greatest and most personal achievement and is routinely placed on lists of the ten best films ever made. It's surprising it only warranted two Oscar nominations - sound and art direction - sadly he lost both. It's amazing to consider that Hitchcock was 60 years old when he made Psycho. His age was not a factor and the film's smaller scale was a personal choice rather than a financial necessity. Psycho is definitely one of my all time favorite Hitchcock films and it seems to be the apex of Hitchcock's popular and critical appeal. Thanks for making some of the best thrillers around. We tip our hats off to you, Alfred. What are some of your favorite Hitchcock films? I loved "Dial M for Murder" and "Rear Window". They're definitely my faves. I'm a fan of almost all of them. Dial M for Murder and "Vertigo stand out for me. Strangers on a Train is great and it was the inspiration for another one of my favorites: Throw Mama from the Train. Pyscho is probably a great film but I was never really able to enjoy. I think all of the parodies ruined it for me long before I ever got around to seeing it. His television series is fantastic and you can stream them all on Netflix.